It is common to see people worry if they hurt their hand, and it bleeds. Yet, not many people think it is a big deal when their gums bleed while flossing or brushing. In a 1999 study conducted by the U.S. National Institute of Health, researchers discovered that half of Americans above 30 were experiencing bleeding gums. Inflamed and bleeding gums are the initial symptoms of bacterial infection of the gums. If you do not get treatment, the disease can worsen, going on to damage structures holding up the teeth in the jawbone. Consequently, the tooth will no longer be firm and will therefore require extraction. Periodontal is derived from "peri," meaning around, and "odontal," meaning teeth. Periodontal diseases include all infections affecting the structures surrounding the teeth, such as the cementum covering the root, the gums, the periodontal ligament and the alveolar bone. The first stage of periodontal disease, called gingivitis, only affects the gums. When the condition worsens, all structures supporting the teeth are affected too. 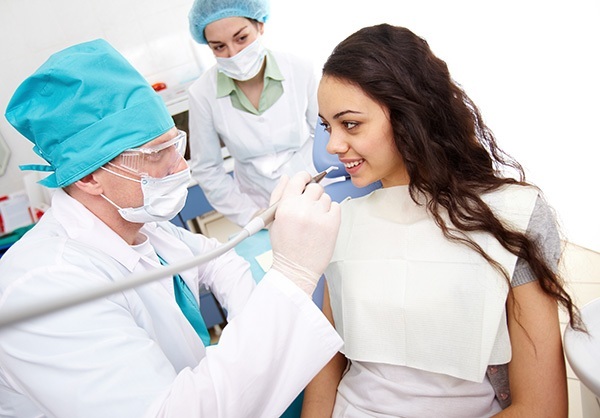 Over the years, scientists have attempted to determine the exact cause of periodontal disease. Many experts agree that the bacteria found in dental plaques are the main culprit. Studies are also ongoing on how gum infections affect overall body condition. Plaque is a sticky material that forms from the accumulation of food debris in the mouth. Combined with the bacteria in the mouth, they produce acid that wears away the enamel. Upon detection of plaque bacteria, your body’s immune system will attempt to eliminate them by releasing chemicals that cause inflammation and damage the periodontal ligament, gums or alveolar bone. This causes gum inflammation and bleeding, the first sign of periodontal disease (gingivitis). The resulting damage can make the teeth shaky, which shows that the condition is in its secondary stage. Recently, there have been indications that gum diseases may be associated with some health conditions. You can reduce the risk of developing periodontal disease through excellent oral hygiene and booking regular dental appointments. Although experts recommend seeing the dentist once every six months, you will need to see the dentist more often if you already have dental disease. You can eliminate most plaque from your teeth by brushing and flossing regularly and correctly. Expert cleaning by the dentist or dental hygienist will remove plaque from areas inaccessible by the toothbrush or flosser. When you deviate from your oral habits or miss dental appointments, plaque eventually builds on the gum line and is usually shielded from brushing. If you do not remove it, the bacteria will keep multiplying, and the inflammation will worsen. Another vital reason to eliminate plaque is that it accumulates and hardens into calculus, also called tartar. Once there is tartar, the layer continues to build up. When the gum becomes inflamed, the resulting loosening of the teeth creates pockets or spaces for bacteria to accumulate. When you see symptoms related to periodontal disease, contact your dentist immediately. Request an appointment here: https://www.westtexasperio.com or call Advanced Periodontics & Implant Dentistry at (432) 538-3318 for an appointment in our Odessa office. Can Periodontal Disease Be Reversed? © 2019 Advanced Periodontics & Implant Dentistry. All Rights Reserved.